Home is where the Wild is, forming back in 2013 a year after the Silver Blades Ice Rink Widnes opened in 2012 just before Christmas, one of the youngest team in the North Division Ice Hockey League, in the first season Widnes Wild set a bench mark going into their second season with the goal and the willing determination to get promoted, however, the dream still continues as they wrapped up their second season with a heavy defeat in the promotion/relegation games against one of the oldest teams: Whitely Warriors intern were fighting to stay in the Moralee Conference League. The first season of Wild were an unknown quantity for both local and the hockey community the uncertainty and curiosity were questioned, but now they are a force to be reckon with, after reaching the play offs and the promotional games for a second consecutive season. A valiant effort from everyone involved this season, and envied by those teams who were also out there battling it out for the same honour and achievement. 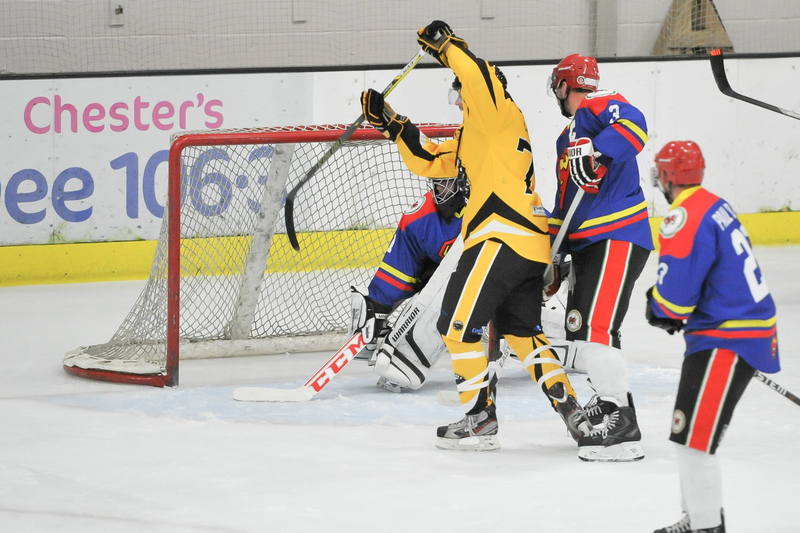 Jumping straight in the deep end, the first game of the season saw Wild take the ice at home against Solihull Barons a hefty defeat for the home team showed in the score line. This quickly improved, it marked the start of the Wild league adventure and campaign with the first win at home and away game, a two game winning streak beating Blackburn Eagles 7-0 then the week later a close game but Wild edging the 6-7 win. Wild were going to do more than just fill out the numbers in the newly formed Laidler Conference and prop up the bottom of the table. 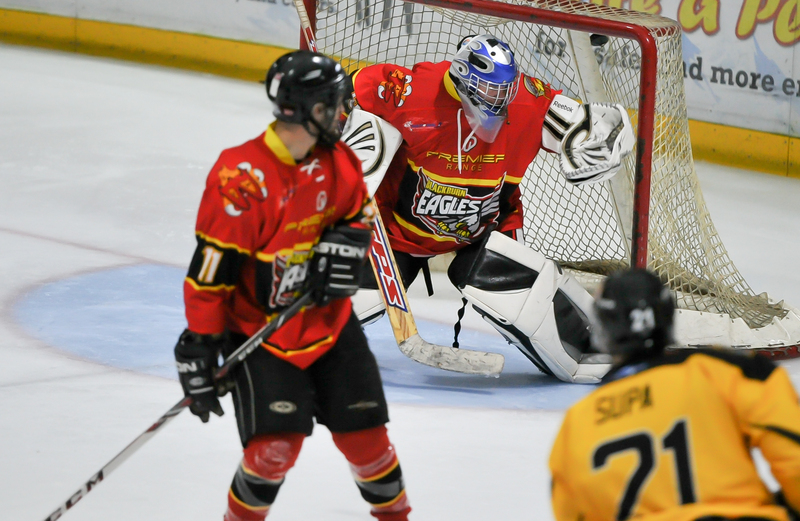 A few weeks later saw a 16 goal thriller which increased to a five winning streak including the local rivals Deeside Dragons this also saw the first draw of the season 5-5 at home to Hull Jets. 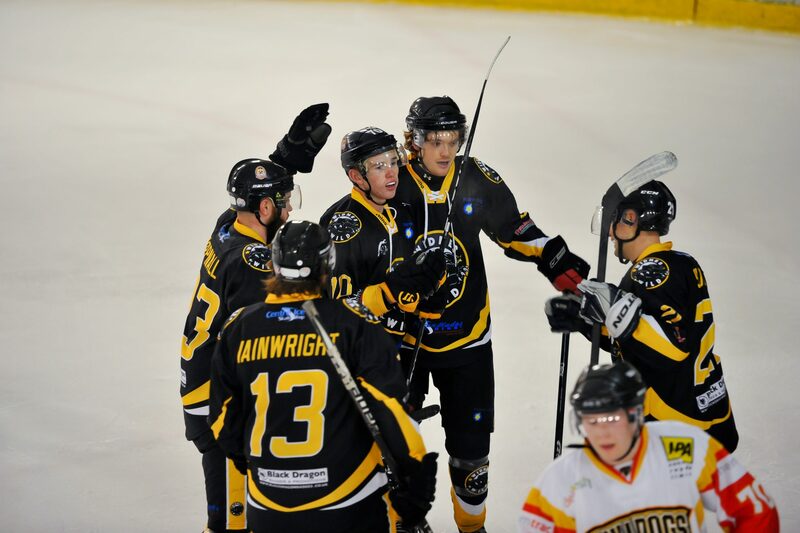 Suffering a 9-5 loose against Solihull Barons away from home didn’t diminished their spirit leading into the run up to the Christmas break, they beat their local rivals again Dragons and Blackburn Eagles, then going on to losing the last game of 2014 against Sheffield Senators. 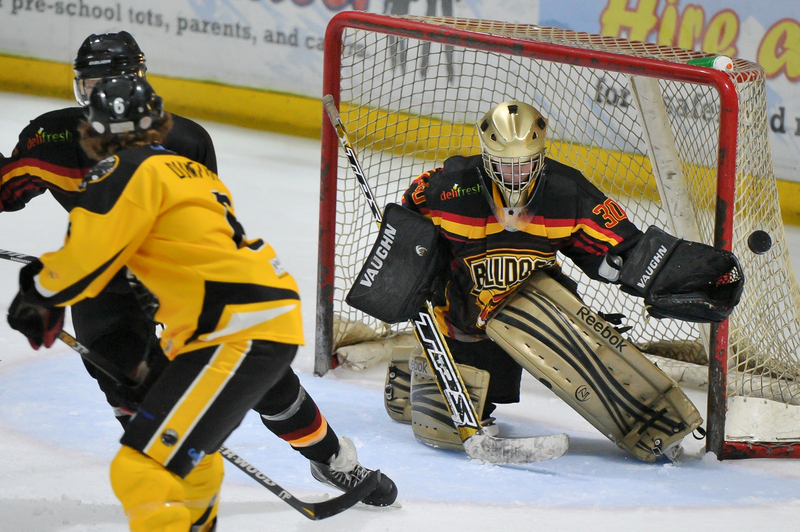 Opening up the New Year in style, after a close 2-0 defeat to Telford Tigers, then seven days later a Wild played game that saw 13 goals netted by them, against Bradford Bulldogs. A defeat to the Barons who were still unbeaten at this point in the season, played Widnes both home then following an away game and as expected Wild were unlucky in both games, setting up a nail biting end to season in which Wild could qualify for the playoffs and be in fourth if they won their next couple of games. However, that didn’t break the camel’s back, huge pressure on the shoulders of the team, as Wild had a string of wins, and with only four games left it was revealed, the results meant Widnes Wild had already qualified and secured their places at the play offs and the all-important promotion fourth spot in the league table. It was in touching distance but still had to complete the season. It was announced in the play offs they would be facing League Champions, Solihull Barons, who hadn’t been defeated in over 30 games. 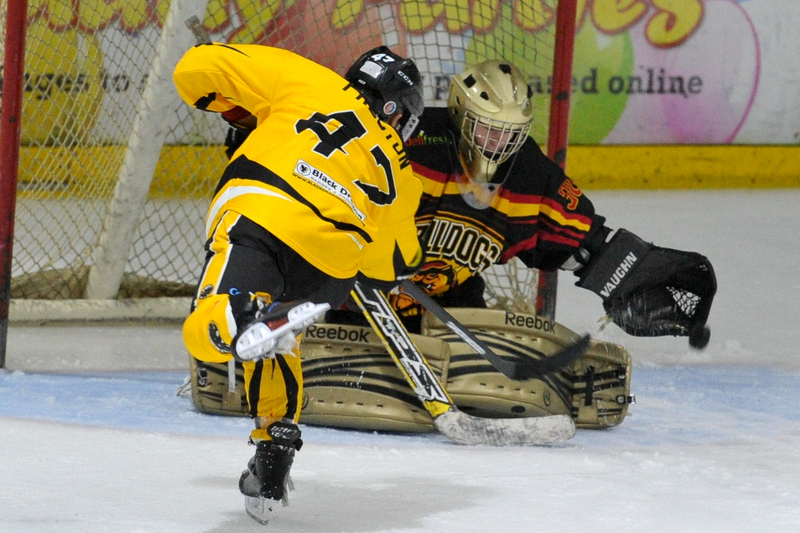 The rest of these opponents in the league games saw a dominant Wild, they did this in ordinary fashion going back to winning ways beating teams in the last seven fixtures, and Widnes Wild finished their last game on the road to Bradford Bulldogs beating those 10-3 bringing home two points which concluded the 2014/15 campaign. The victory meant that the Wild have gone through the season being victorious in 21 games out of the possible 36, they finished the season with 43 points out of the possible 72 and in fourth place hoping to better that next season. With Solihull Barons were unbeatable all season being promoted to the Moralee Conference League there is a chance for Wild to go for the League title next season. While the Barons dominated the campaign in an understatement, they were in a league of their own, Wild played their own game finished with a goal difference of 37 the next highest was Sheffield Senators with 79. 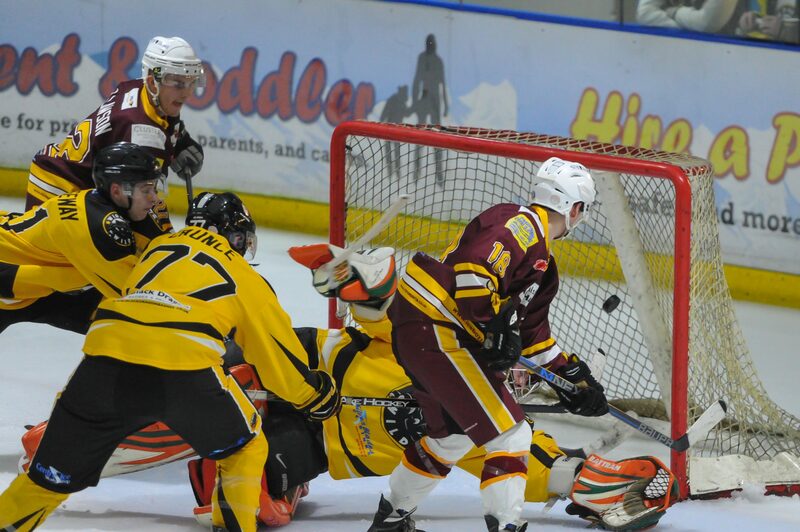 When the stats were released just after the closing to the season showed as expected Barons were on top, despite this Filip Supa is fourth in the top 10 points scorers with points, while this was dominated by James Smith of the Telford Tigers who is this year’s league’s top leading goal scorer. Wilds’ Greg Ruxton placed fifth in the top 10 net-minders saves, with Nicole Jackson sneaking in tenth in the Laidler Conference League. Many players were unavailable for the play offs trying to avoid injuries before the vital promotion games with Whitley Bay, despite this for some of the game Wild put up a fight and matched their opponents who went victorious all season however, the score line was in favour of Barons 12-3. This was a good preparation platform leading into the promotion games. “Risk something or forever sit with your dreams.” Herb brooks said, in such a short history for the team, the youngest team in the league take on the most prestigious team Whitley Warriors, with a history dating back to the 1950’s help develop massive talent in British Ice hockey. The Warriors have lost themselves a little; as they are not the nationals force what they used to be. There was so much hype great coverage in the local paper and on social media, the Wild in both home and the travel to the seaside as they aim for the place in the upper tier in the National Ice Hockey League. Warriors provided a major challenge for Wild they were victorious in the first leg of the promotion games, for Wild it was a disappointment but the spirits, everyone involved in wild still had their hopes and dreams did not diminished were still there as the following night it was still all to play for. Skating with their hearts on their sleeves they had everything to prove on the ice but fell short of the dream, the team traveling back to North West, coming home still in the Laidler Conference League for a third season consecutive year as Whitley Warriors see yet another season in the Moralee Conference. 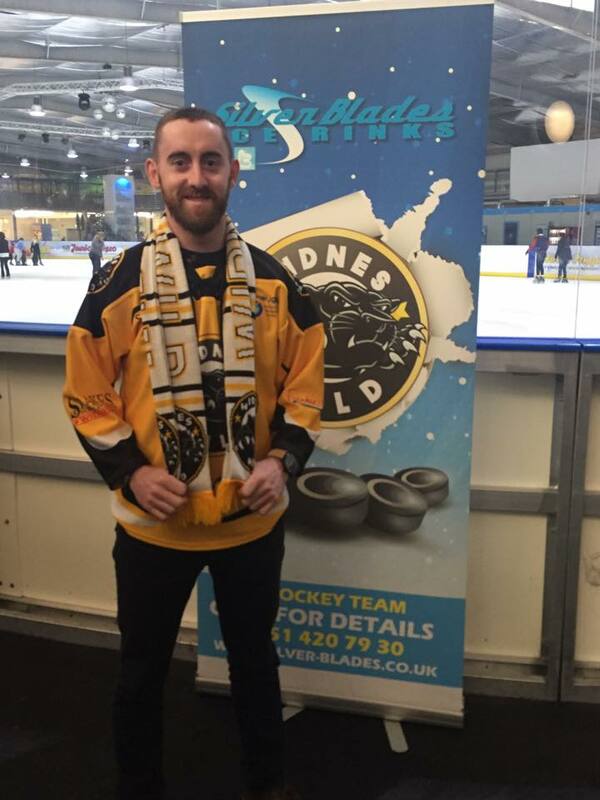 Despite being a newly formed team over the last two years Wild have acuminated a big fan base Widnes Wild One Supporters Club chairman, Mike Hughes says: “In terms of last season, overall it was a success but I think we paid for a lack of physicality in both defence and attack at times. It was a great to reach the promotion/regulation playoff in our second season ahead of long established teams like Nottingham and Deeside. Our fans are superb, especially those who travel regularly to away games. Opposition fans and players regularly comment on how good and noisy our fans are and how many we take. Definitely the best supported team in the league. It has been announced that Scott McKenzie is appointed as the new head coach on a two year contract with the team, he has experience of playing ice hockey at all different levels; he was one of the leading players of the Telford Tigers English Ice Hockey Premier League. Scott McKenzie comes into the team with a view of enhancing and strengthening the playing squad, driving the club forward into their next adventure and hopefully with hard work and dedication from everyone at the club into crossing the line of succeeding, maybe third time lucky will do the trick. Becoming league champions would mean the Wild would then be able to be automatic promotion to the Moralee conference league rather than to be in a scrap fight at the end of the season with two extra games for the promotion home and away game competition. Players for next season Wild expect the majority of last season’s team to lace up their skates as part of the and ready to go wild on the ice. The team are currently in talks with a number of players who they have targeted, in helping to strength the squad as a whole. The official team roaster will be announced via the Widnes Wild website in the coming weeks with two player announcements next weekend at the meet the coach event which will include a question and answer session in Runcorn. Wild will continue down the route of where players will not have to pay into the club for them to be allowed to play the game with all team costs being met by the club, this is looked upon very favourable for the team members, comparing to other clubs in the league which is very refreshing to see. In addition to this the club will continue to sell merchandise such as scarfs and jerseys available at home games for the fans to buy to assist in raising funds. Last year Widnes Wild launched the Academy which provides a pathway for people into playing ice hockey through to the senior teams including career opportunities for players who want to develop a career in ice sports, in March 2015 the club revealed a huge demand for the opportunity, Warrington Collegiate will be working in an unique partnership that will see a new qualification, the Level 3 BTEC in sport at the Widnes Wild Academy. This is the first FE College to offer the course in the UK with Team Great Britain senior men’s ice hockey tem Peter Russell as part of delivering lectures to the young adults on the course. Wild’s traditional media coverage will continue over into the next season with Colin Ellis delivering video highlights in HD of the homes games and the occasional away game and on social media the Widnes Wild twitter page will continue to grow as more fans follow and the constant updates, weekly match previews and match reports are to be posted online and some coverage in the Widnes and Runcorn weekly news leading on to the plan of match programmes at every home game of the team being put together by the off ice team and Scott Mckenzie taking the lead on this opportunity for the team and to expand as a club. To conclude, as the ice sport is slowly becoming popular in the United Kingdom, with an increasing fan base Widnes Wild have been successful in establishing themselves among the ice hockey community, the team have had a great second season despite the disappointing result in the promotion games this goal will continue into next season and are planning to have an even better third season where fans could well see the team pushing to win the league and if possible automatic promotion and maybe another chance at the play offs. After a long summer break the newly formed structure team will mean business, lacing up their skates to take the ice to have another attempt at their main objective which is promotion when the season starts back up again in September with pre season games announced to be a home and away game against newly promoted in the Moralee Conference League Solihull Barons then leading on another team in the top tier league Blackburn Hawkes.